This is the last stop. This is where the spill will happen, and its shell will go to the dark place. It shuffles slightly forward and backward, side to side, from time to time. It travels from box to bin, cardboard to plastic. Sometimes it gets thrown onto the floor. It anticipates that moment of true movement when it rises above the others just before the spill, but things do not always go as expected. Pockets lock it in and transport it to a new bin, another place to spill, and it just waits to see what happens next. If it falls on the floor we can always do a soft shoe shuffle eh! I think what happens next is that it goes directly to my waistline. ;-) But now I'm afraid it is lying in wait for something even more nefarious. Ugh, this reminded me of something that happened when I was a kid -- someone (not me!) kept sugar packets with drawings of famous monuments as a souvenir of a cross-country trip, and they spilled. And attracts ants. Lots of ants. Gotta love the written word. 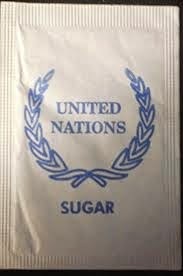 Even sugar packets get to be existential. Personally, I like to grab oodles of them and pour them all out in the center of the table to make sugar sand castles.